Summary: Last month’s statement concerning a review of CGS’s machining division had already braced me for worrying news. In the circumstances, this RNS was not too bad. Sure, the machining division has reported a loss and will cut back on certain projects. However, CGS’s main foundry operation appears to be performing very satisfactorily, with profit per tonne reaching a new high. I continue to hold. These results were not as bad as I had feared. A statement last month announced that Adam Vicary, CGS’s chief exec, had assumed “operational responsibility” for the group’s machining division and that a full review of the department was underway. The terse update sounded quite ominous, especially as the machining division had already reported a sharp profit setback within June’s annual results. As it turns out, today’s news was not entirely awful. True, the machining division reported a £1m first-half loss following charges for “stock obsolescence and the recoverability of tooling costs”. Revenue growth at the subsidiary will also be delayed following a decision to exit some projects. However, CGS did claim the machining division would “return to an acceptable level of profitability” next year. So things do appear under control. I was pleased CGS’s foundry division could deliver positive progress. First-half foundry revenue and profit climbed 8% and 11% respectively, helped in part by orders of higher-margin machined parts. The table below shows H1 foundry profit having returned to the level seen during 2016, which was not a bad year for the division. I also note profit-per-tonne-of-castings-sold is now running at £322 a year — a new record for the foundry subsidiary. The diverse divisional updates meant the group as a whole recorded total revenue up 7% and operating profit down 14%. Sadly, today’s RNS showed the worst overall H1 profit performance since 2011. Not surprisingly, Mr Vicary decided to hold the interim dividend at 3.38p per share. The main attraction to CGS’s accounts continues to be the hefty cash pile. Money in the bank at the half-year-end came to £25m, or 56p per share. The balance sheet carries no debt. Cash flow absorbed a net £2m during the half following £7m spent on additional tangible assets. CGS stated £3.3m was invested to support the foundry division’s “automation programme”, while another £2.7m was invested to support “core business customers” within the machining department. I note capex has been running significantly higher than the associated depreciation charge for 18 months now. However, the 2017 annual report did indicate most of the excess has related to additional land and buildings, so the large sums being spent do appear to be genuine ‘expansionary’ items. The books continue to carry a pension-scheme surplus, which at the last count stood at almost £17m. “The pension schemes are related parties of the group and during the period £1,227,000 (2016 – £919,000) was paid by the group on behalf of the schemes in respect of pension payments and administration costs. Quite why CGS continues to pay into the scheme at the same time the scheme is paying refunds to CGS remains a mystery to me that I am not inclined to investigate. Assuming the machining division can return to breakeven, I reckon annual operating profit could be £14.6m. After deducting 19% standard UK tax, I arrive at earnings of £11.9m or 27.3p per share. Subtracting the aforementioned 56p per share net cash position from the 430p share price gives an enterprise value (EV) of 374p per share or £163m. Then dividing that 374p per share by my 27.3p per share EPS guess gives a multiple of close to 14. That rating does not look an obvious bargain to me. Meanwhile, the trailing 13.97p per share dividend currently supports a 3.2% income. Disclosure: Maynard owns shares in Castings. This entry was posted in Castings, My Shares and tagged Castings, CGS on November 10, 2017 by Maynard Paton. This statement does not read too badly, and includes some profit guidance — the first I can recall CGS issuing during the last few years at least. True, further exceptional costs have been unearthed within the troubled CNC Speedwell machining division. It appears new management appointments have dug deeper into the operation. However, the larger foundry division seems to be performing as expected and the implication for current-year profit is a little better than I had anticipated. The performance of the foundry businesses continue to be in line with market expectations supported by steady demand from our commercial vehicle customer base. Following the change of management and completion of the review of the machining operation, certain projects have been identified that are not considered suitable for the group. The total cost of exiting these projects is £1.3m which comprises write-downs of specific capital and tooling equipment and exiting contract commitments to purchase equipment. In addition to these project specific items, the continued disruption in supply has resulted in higher than previously anticipated costs, particularly in relation to excessive transport, to ensure customer schedules are met. The total financial impact in 2017/18 of the reorganisation of the machining business is expected to be a non-recurring cost of £3.4m, including £1.2m of excessive transport costs. 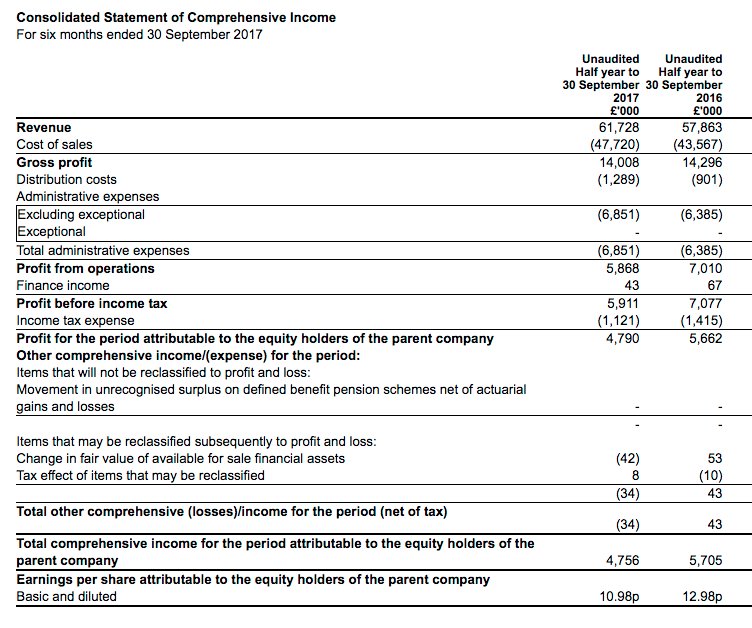 After taking into account these costs, the directors expect the group profit for the year to be in the range of £12.5m – £13.5m, with positive cash flows being generated. The group are pleased to announce that Steve Barwell, following an interim period, has been appointed General Manager and Director of CNC Speedwell Limited. Two further additions to the management team have been recruited and will join by the end of March 2018. The machining division will incur one-off costs of £3.4m, leaving “group profit” (which I assume to be equivalent to operating profit) at approximately £13m. The figures therefore suggest underlying group profit will be approximately £16.4m, which compares favourably to the £14.6m I mentioned in the Blog post above, and the £15.5m reported for 2017. A £16.4m underlying operating profit may translate into earning of roughly 30p per share.